Earth Day began in 1970 in the USA and is celebrated on 22nd April each year. It is a day to think about our planet and what we can do to keep it healthy; to think about saving water and energy, reducing pollution, recycling, protecting our animals, trees and plants, and generally getting kids interested in protecting their environment. Gather family and friends together on a beach or at the park and combine a picnic with a litter pick. Even the little kid in a sling can be part of this! Get your kids to recycle everything they use on that day; milk cartons, paper etc. into the right boxes in your home. Let recycling become part of their everyday life. Have a toy clear out and donate them to your local homeless shelter or charity shop. Do make sure your child selects the toys to go themselves. A few years ago my friend and I hosted an Earth day party at our local park and invited about 10 families. They thought we were mad but came along anyway and it was really lovely. We did bark rubbings, a walk around the park and we had tree shaped home-made biscuits. We all bought a book along to swap and we planted runner bean seeds in little pots to take home. We had the best of times, spent very little and we were teaching our kids something important. Why don’t you think about hosting an Earth day party? 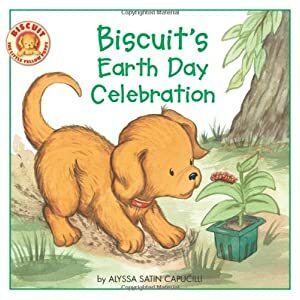 This is a very cute little book about Earth day, all about caring for animals, planting seeds, picking up litter, etc. These are all things that even very young children can understand and be involved with. It’s really nice way to get them thinking about Earth day and what it involves. For ages 2-6. Maybe after reading this you could take some water and seed out for the birds? Lovely blog post and some great ideas for earth day. It is never too early to introduce green concepts to our children, then it will be a natural way of life as they grow up. These are also the kind of things that they will remember about their childhood.